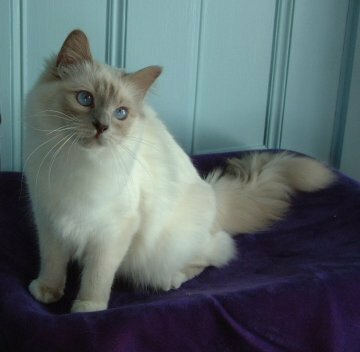 Treasure is a Tupper daughter out of a beautiful bluepoint girl with huge blue eyes. And these eyes are being passed on to daughter and grandkittens. Treasure has them, as do her kittens. Shown as a kitten, Treasure was well received by the judges. She decided that having a family was more important than the show ring, and she may have been right. Her kittens are beautiful. Zanadu Butterfly Kisses, her chocolate point daughter is now in South Africa wowing the judges there. Treasure is now represented here at Zanadu by her daughter "Flirt" (Ch Zanadu Do You Love Me) who is the image of her mother. Treasure has now gone to her new home along with Amber.